This argument seemed to sway her. She nodded. Even Lily sighed in relief. Wil helped her gather her supplies together and loaded it in the buggy. 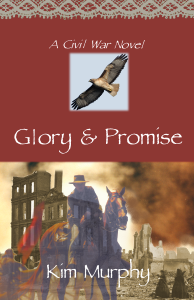 After tying his dapple-gray mare to the back, he climbed in beside her and cued Amanda’s red stallion to a trot. Tense men stepped out of their way, and Amanda sat back in silence. “You were trained as an engineer at West Point,” she suggested. He should have known that her first husband had told her about their experiences at the Point. Over the years, they had come to know each other too well. By nightfall, they reached Fredericksburg. Moonlight illuminated dreary chimneys and buildings still shattered by war. He halted the buggy out front of the brick house that he shared with Alice. After climbing down, he helped Amanda. For a brief moment, she was in his arms. She felt good. But he had to keep those thoughts to himself. So many secrets–he could no longer keep track of them. On a fine Indian summer day, two weeks later, the shanty village faded into the background. “Wil, stop the buggy,” Amanda said with a smile. Wil hadn’t seen her smile since losing her baby. He clambered from the buggy, then helped her down. As he secured the stallion to a sycamore tree, she strolled along the edge of the river. Removing his hat, he joined her on the rocks near the bank. “Proper? Amanda, we’ve been friends for years.” But there was one topic they could never broach. The letter… If only he had mailed it, she would have never married Sam. So close, yet so far away. He nodded in understanding. “Wil, I think it’s best if you don’t accompany me anymore, unless Alice is along.” Her skirts rustled, and tears streaked her cheeks as she dashed past him to the buggy. So he wasn’t the only one who felt the tension. The Rappahannock waters churned, carrying him under. Sputtering and gasping for breath, he managed to put his head above water. At the end of the murky tunnel, Wil saw Amanda. It had always been Amanda, and no one else. The full version of this romantic historical novel is now available from Coachlight Press in Trade Paperback and Electronic formats.